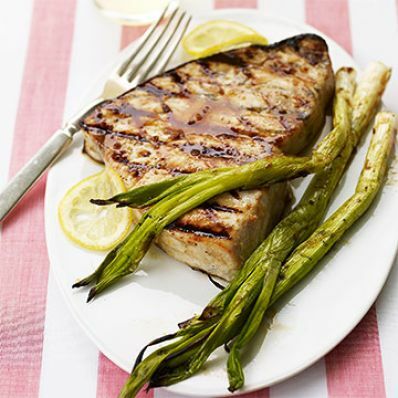 Tuna, salmon, snapper, and swordfish are best for the grill--their firm flesh holds together over the grate. Add an Asian flair when you add a teriyaki, honey, ginger, and garlic marinade. 1 of 3 In large resealable plastic bag, combine teriyaki sauce, honey, vinegar, ginger, canola oil and garlic. Add swordfish, close bag and shake to coat fish completely. Place on a plate and refrigerate for 1 hour. 2 of 3 Heat gas grill to medium-high or prepare charcoal grill with medium-hot coals. Lightly coat grill rack with oil or nonstick cooking spray. Grill swordfish for 5 minutes. Baste with some of the remaining marinade, turn and grill for an additional 4 to 5 minutes or until cooked through. Brush scallions with marinade and place on the grill for the last 4 minutes of cooking time. Remove fish and scallions to a platter and cover with foil to keep warm. 3 of 3 To serve, boil remaining marinade in a small saucepan. Drizzle over the fish. Garnish with lemon slices. Per Serving: 273 kcal cal., 35 g pro., 317 mg sodium, 1 g fiber, 10 g Fat, total, 9 g carb., 2 g sat. fat, 66 mg chol.